I’ve been meaning to make my own scrub for years now and put it off for some reason. At the same time, I’ve spent an inordinate amount of time looking for a natural body scrub the scent of which I liked. Most scrubs I encountered had ingredients I didn’t like, and the rest smelled like a cross between a flower meadow and a bakery, neither of which appealed to me. 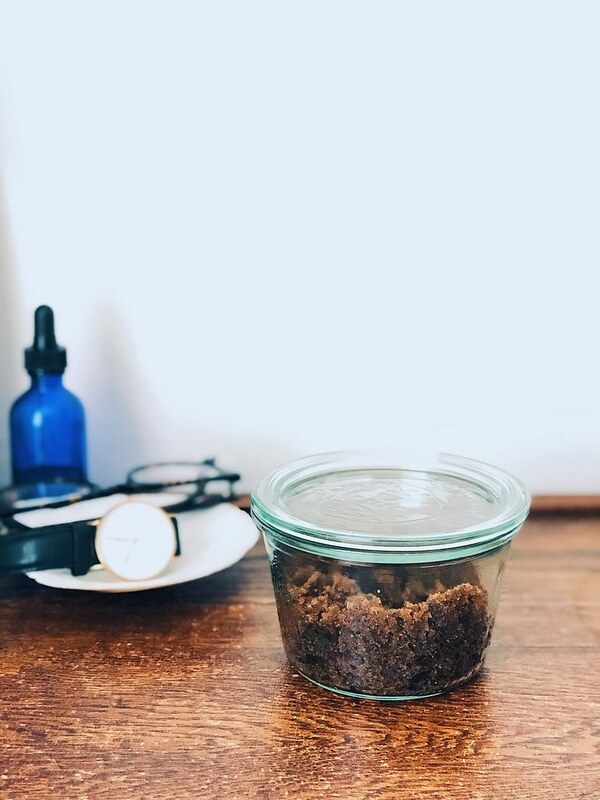 So this year, I resolved to make my own and realized that this scrubs takes just three or so ingredients, all of which I had in my pantry: brown sugar, olive/coconut oil, and essential oil—I used eucalyptus. A lovely nudge in the right direction was this post from Erin. The ingredients took me a couple of minutes to measure out, a minute to combine, and I had my own scrub (with pronounceable non-toxic ingredients) in under five minutes. Once combined, I transferred my scrub to an empty glass Weck jar I had on hand. In doing the math, making your own scrub is also significantly cheaper than purchasing a similar pre-made kind—a great thing for the budget-minded. But my favorite aspect about making my own is the ability to customize the scrub with a scent of my choosing, be it herbal like rosemary or lavender, flowery like rose or gardenia, or sweet and delicious, like vanilla and cinnamon. If using coconut oil and it is solid at room temperature, melt the oil first for mixing in. If you like, you can even combine essential oils that tend to go together, like myrrh and frankincense. In a small bowl, stir together the sugar, coconut or olive oil, and essential oil until incorporated. Transfer to a sterile container/jar, cover, and store for up to 3 months. The scrub probably will be good beyond the date but sometimes oil can go off a bit. Also, small batches guarantee you will be making this more regularly, and since it’s so easy, it shouldn’t be a problem. Glad you are back. You were missed! Aw, thanks! It’s nice to be back. While I’m more focused on cookbook writing, it’s nice to come here and write. What a blessing this popped in! I did not recognize the namely first, but when I followed the link it became clear. A warm welcome back, and I will have more time for this since I am on the cusp of retirement. The fate part of this I picked up some leeks on a lark ;) at the store Sunday to do something with. When I went to your page I saw the leek and potatoe soup recipe so out of nowhere an solution to the leek problem was given! All I need now is to go to Wegman’s for the cheese rind! Thank you so much! What a pretty child too! Bob – thank you so much for your kind comment! Enjoy the soup and congratulations on your upcoming retirement. I’m sure you’ll find exciting adventures to keep you busy!